Happy Halloween! This year for the work party I knew I wanted to do something with the rest of my Mutsu apples, and thought of caramel apples in cake form in the shower one morning. A quick internet search revealed several delicious-looking recipes, but this one won because it was simple, and I needed to make a double batch! I won't retype the recipe into my blog, since you can find it everywhere online, like here. Happy Halloween! 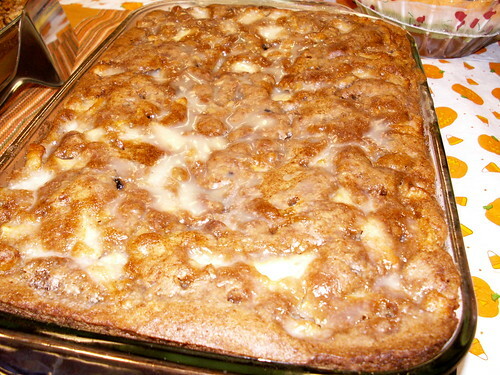 I was originally planning to bring this to a work party, but I'm going to have to make apple cake or something else, because I don't think I need to try a recipe more than two times! Ever since I saw the Cakespy post on homemade candy corn, I have intended to try making this sugary treat. I couldn't believe the response from people. "Ugh, I hate candy corn." "Isn't that just corn syrup and coloring?" As anyone who knows me knows, these types of comments only made me want to make candy corn from scratch that much more! I tried for the first time last night, using Cakespy's recipe as written. I got about 3 minutes into the cooking time and my instincts told me to pull it off the heat, but I didn't listen. Well hello, following my instincts lesson. Nice to see you again. By the time the mixture had even partially cooled, it was all dry, crumbled, and impossible to get out of the pan. Total failure, I didn't even take pictures. In the comments of Jessie's original post, there was a link to a similar recipe in The Washington Post, which included a cooking temperature instead of just minutes. I was just about right with my gut reaction the first time around, because the mixture reached 225 at 3 minutes in. The next stage is the other part of the recipe that hasn't worked well, where you let the mixture cool. The recipe says 30 minutes to an hour, but I only waited 30 and that wasn't enough time to work with the mixture before it was too dried out and crumbly to properly knead and work color into. 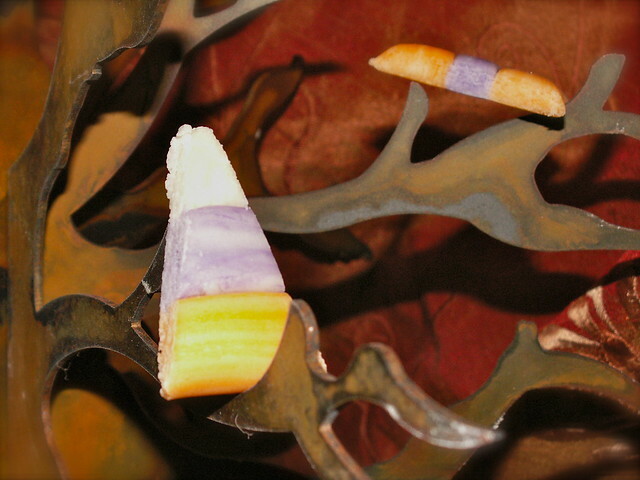 I was only able to make candy corn with about 1/4 of the mixture, and even that didn't stick together very well between the colors. 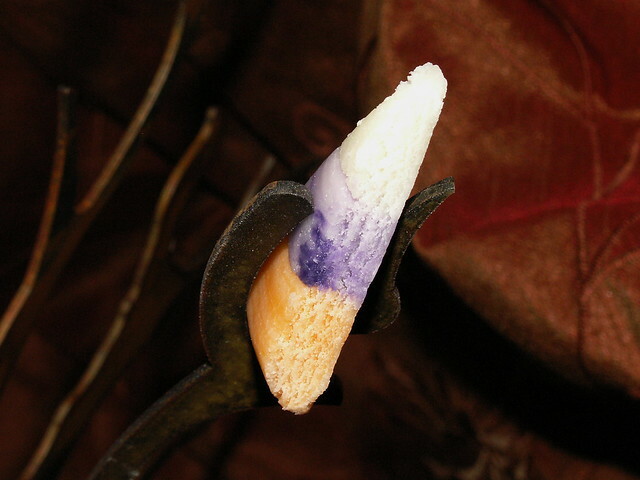 I think the value of the commercial candy corn made by machines instead of by hand is that they can add color to magma-hot boiling sugar without fear of injury. I'm just not sure that this recipe is a great idea for the home cook. 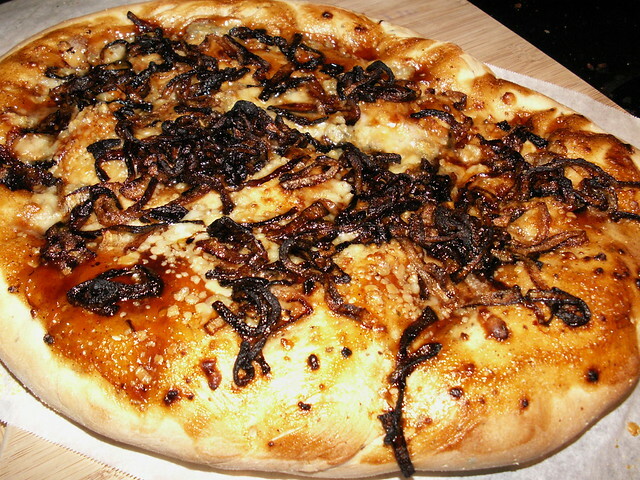 I had it in my head that I wanted pizza with carmelized onions, blue cheese, and barbecue sauce. I usually make the Peter Reinhart recipe, which is fantastic, but I always get into trouble if I don't plan a day ahead. And sometimes you just have to have pizza right that minute! One of the cookbooks I use a lot for baking is A Passion for Baking. I'm not going to include the recipe here because you should buy it for yourself, but I had to try the recipe that claimed to be the "best pizza dough ever." I think the true secret to her claim is the method - you barely mix the ingredients together and let it sit and bloom, and after shaping the crusts and putting on the ingredients it rises one last time. I'm not sure if this attempt is a fair representation, because my Kitchen Aid of less than two years of age's motor QUIT while kneading the dough. I was frazzled and didn't knead it any longer after I got the bowl down, but I think it had already gone for the recommended 5 minutes. The funny thing is, I don't even mind kneading dough, and actually enjoy it. I was just sticking to my guns of using the recipe as written the first time. So the dough didn't have as much give to it as the Reinhart dough, and I really had to struggle to roll it out as thin as we like it. While baking it puffed up quite a bit, and was chewy and thick. The toppings combo was delicious (although you can see in the picture that I may have gone overboard when 'carmelizing' the onions), although the crust was pretty dominant. Knowing what I know now, if I made this recipe again I'd use a lot more sauce to help the balance. In the meantime, I'm approaching Thanksgiving, and always do more baking in the fall, and I need to get my mixer fixed! There is a certified technician in town, so cross your fingers! I had a beautiful bag of Mutsu apples from a little farm stand between Flat Rock and Hendersonville, NC, just begging to be made into a delicious baked good for fall. Mutsu apples are a cross between Golden Delicious (for sweetness) and Indo Apples from Japan (a sturdy baking apple similar to Granny Smith, from what I can find out), so I thought they'd hold up well in a pie. 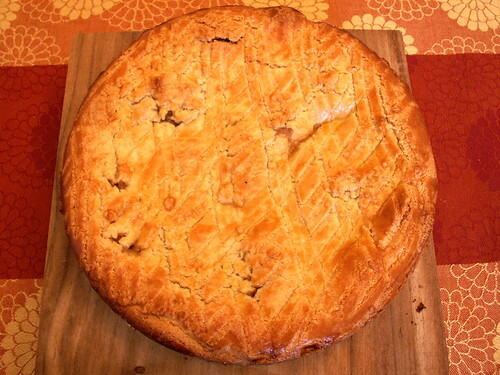 In this Breton Apple Pie from The Modern Baker by Nick Malgieri, the apples are prepared and cooked on the stove before they are spooned into the crust. The crust had more of a sugar cookie taste to it than pie crust, and looked beautiful when it came out of the oven. The springform pan I baked this in is pretty dark, so I should have thought to turn the oven temperature down by 25 degrees. Since I didn't, some of the bottom of the crust got darker than I would have liked. I didn't have any other 10" pans. Malgieri says this recipe is freezer-friendly, and I think the next time around I might make it in a 9" cake pan instead. 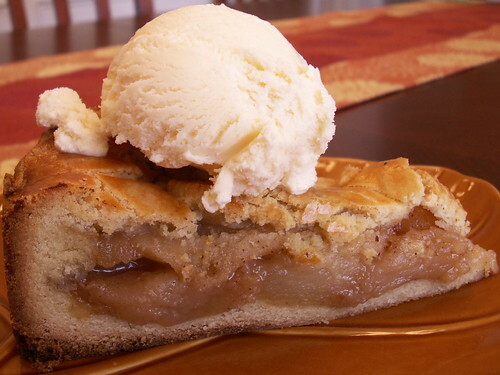 That way I can use a few less apples but end up with a slightly higher "pie." 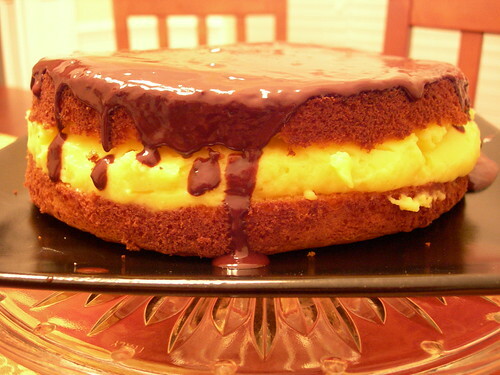 Something Nathaniel said in passing yesterday as I was making my grocery shopping list made me announce, "That's it, I'm going to make a Boston Cream Pie." I hadn't ever made one from scratch. Who knows what triggered it?! I used the yellow cake recipe that I used earlier this week for cupcakes, and froze one layer for later. I used Gale Gand's pastry cream recipe for the filling, which used up almost all the egg yolks I had leftover from making the perfect party cake the other day. Nice when it all evens out. 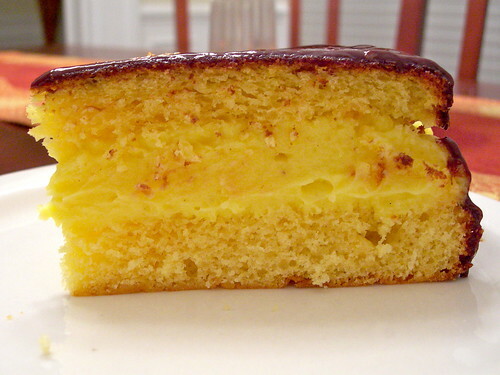 I topped it with a slightly runny ganache, but it was good - homey. In the slice you can even see the vanilla beans in the custard. Hey, if you've been following JennyBakes in Facebook, I discovered that the notes aren't importing. While I try to talk to a real person at Facebook to get past my error message, I may start manually posting to the page. But you've missed a lot if that's the only way you see me. Sorry about that.